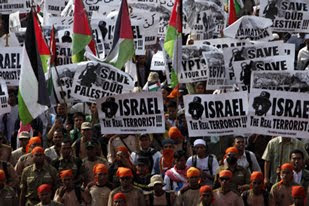 With the exception of the United States, nearly all the world's nations; newspapers, radio and TV news stations; the United Nations; and the world's Leftist academics and organizations have condemned Israel over the Gaza flotilla incident. The characterizations of the Jewish state range from a society so evil that it should not be allowed to exist to a villainous nation that is responsible for a) the suffering of millions of innocent Palestinian men, women and children; b) the lack of Mideast peace; therefore c) the Muslim world's anger at the West; and therefore d) Islamic terrorism itself. Let's hope the world is right. Israel is almost totally isolated. A visitor from another planet would have every reason to report back home that the greatest problem on planet earth was this planet's Jewish state. Though Israel is the size of the American state of New Jersey and smaller than El Salvador, and though its population is smaller than that of Sweden, Burundi and Bolivia, it is the most censured country in United Nations history. Though Israel is a thriving liberal democracy for all its citizens, including the one out of five that is Arab (83 percent of whom are Muslim), with an independent judiciary and press; though it signed an agreement establishing an independent Palestinian state; though it returned to Egypt every inch of the Sinai Peninsula, a land mass larger than Israel itself with major oil reserves - the world deems Israel a villain. Though Hamas runs a theocratic police state based on torture and terror, with no freedom of speech, no freedom for any religious expression outside of radical Islam, seeks to annihilate the Jewish state, and its state-controlled media depict Israelis and Jews as worthy of death, the world sees Israel, not Hamas, as the villain. "The EU condemns the use of violence that has produced a high number of victims among the members of the flotilla ..."
"The President of (France) expresses his profound emotion in the face of the tragic consequences of the Israeli military operation," Sarkozy's office said. "He condemns the disproportionate use of force ..."
"Spain unequivocally condemns the Israeli attack on the humanitarian flotilla and it does so as a country and as the acting president of the EU Council." "Swedish Port Workers Union spokesman Peter Annerback says workers will refuse to handle Israeli goods and ships ..."
"The Swedish Football Association said it was to ask European football's highest body, UEFA, to rule if the qualifier scheduled for Friday in Tel Aviv should go ahead or not, citing the 'strong reactions in Sweden and around the world.'" "Norway's military says it has cancelled a special operations seminar because the Defence Ministry objected to the inclusion of an Israeli army officer in the program ... Norway calls for boycott on arms to Israel." South Africa recalled its ambassador to Israel, Ismail Coovadia, "to show our strongest condemnation of the attack." India announced that "There can be no justification for such indiscriminate use of force, which we condemn." "The Argentine Government expressed on Monday its condemnation of Israel's naval attack to an (sic) humanitarian six-ship flotilla." The Brazilian Foreign Ministry in a statement said that "Brazil strongly condemns the Israeli attack, because there was no justification ..."
Italian foreign minister Franco Frattini: "I deplore in the strongest terms the killing of civilians. This is certainly a grave act." The News, the leading Pakistani English daily: "This monstrous outrage has caught the world's attention and once again put the spotlight on the activities of a state that has been a law unto itself for most of its life." China's Foreign Ministry spokesman Ma Zhaoxu: "We were shocked by the Israeli attack which led to severe casualties and condemn it." Let's hope that the European Union, France, Spain, Sweden, Norway, South Africa, India, Argentina, Brazil, Italy, Pakistan, China and nearly all other nations are right. And not just nations, of course. According to Amnesty International, "It is imperative that Israel lifts the blockade of Gaza without delay, as it is a form of collective punishment ... Israel should invite the relevant UN experts to carry out an investigation ... It begs credibility that the level of lethal force used by Israeli troops could have been justified. It appears to have been out of all proportion to any threat posed." Since blockades are "collective punishment," presumably Amnesty International deems all blockades as immoral. The U.N. is fair regarding Israel, so Israel should support a U.N. investigation. And the Israeli soldiers should have allowed themselves to be beaten to death rather than throw away their paintball guns and use real ones. Let's hope Amnesty International is right. "Were the boats ferrying novelists and Nobel Peace Prize winners and elderly Holocaust survivors, as news accounts have suggested, or seething Israel haters, as defenders of the raid would have us believe?" Apparently, the Los Angeles Times believes that novelists, Nobel Peace Prize winners and elderly Holocaust survivors cannot be "seething Israel-haters." "Was the goal to bring 10,000 tons of aid to needy Gazans in an act of peaceful civil disobedience, or to provoke Israel into just this sort of violent response? ..."
I did not make this up in order to embarrass the LATimes. They really posed this question. "We agree with U.N. Secretary-General Ban Ki-moon that the blockade '... hurts forces of moderation and empowers extremists.'" Unlike the Times, many of us thought that Palestinian extremists were more powerful than the "forces of moderation" prior to the blockade. Let's hope the Los Angeles Times is right. "There can be no excuse for the way that Israel completely mishandled the incident ... It has damaged Israel's ties with Turkey, once its closest ally in the Muslim world." "No excuse?" Being beaten to death by "peace activists" while carrying paintball guns is "no excuse"? And why wasn't it Turkey's sponsorship of an Islamist organization labeled a terrorist group by the American government that damaged Turkey's relations with Israel? Why is it not Turkey's cooperation with Iran's Holocaust-denying, Holocaust-planning Ahmadinejad that has damaged Turkish-Israeli relations? Let's hope The New York Times is right. The reason mankind has to hope that the world, its leaders, its newspapers, its so-called human rights organizations and the United Nations are right about Israel is quite simple: If Israel is the decent party in its war with the Palestinian Authority and Hamas - and nearly all the world's countries, nearly all the world's media and the United Nations are morally wrong - what hope is there for humanity? If the world's moral compass is that broken, are we not sailing into a dark age?